Thanks to the lunar calendar, Hanukkah feels extra early this year—kicking off on Sunday, December 2, just a week or so after Thanksgiving. But who are we to complain? It just means we’re nearer to the Festival of Lights, a.k.a. a celebration of family, remembrance, blessings and, of course, fried foods. If you feel like you’ve got less time to plan your feast, don’t fear: These L.A. restaurants have you covered with full meals to go, specials and dinner events that even your goyim friends will love. The one and only culinary emcee extraordinaire Billy Harris hosts a very special Hanukkah dinner at Genghis Cohen, complete with cocktails, dreidels, gelt, a menorah lighting, live music and the timeless tradition of Chinese food in December—though this Eastern feast features wine pairings. The December 10 dinner, at $99 per person, includes crackerjack shrimp, lo mein, duck, steamed ginger sole and more, not to mention one hell of a Hanukkah party. The best part? A portion of proceeds benefits the L.A. Food Bank. Nab your tickets here. Head for the hills to find the rustic Saddle Peak Lodge's holiday event, where you can expect a family-friendly meal, singing and gelt—plus a menorah lighting ceremony—tucked away in the beautiful Santa Monica Mountains on December 5. 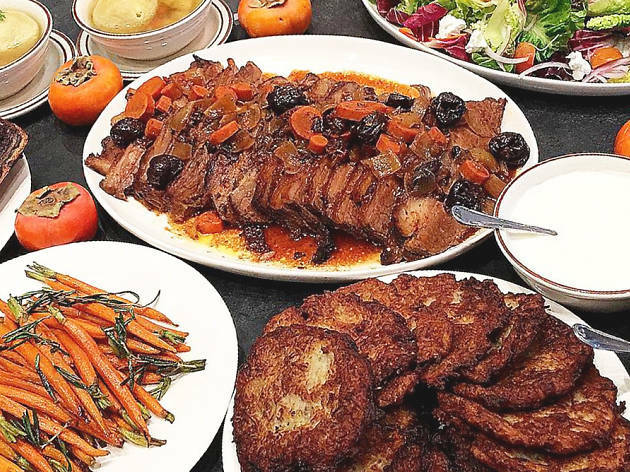 Each $60 ticket includes a three-course meal with items such as potato and celery root latkes with spiced sour-cherry-apple sauce; 48-hour brisket with Ashkenazi potato stuffing and kale-and-mushroom kugel; and halvah and apple doughnuts. Call 818-222-3888 for reservations; event begins at 6:30pm. 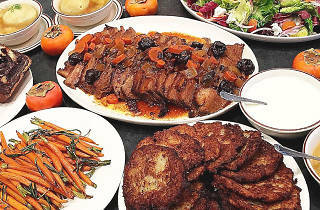 Suzanne Goin and Caroline Styne bring the traditional fare for their special menu, which includes table-musts such as braised beef brisket with horseradish cream, potato latkes with applesauce and crème fraîche, braided challah, and duck-fat-roasted potatoes. There’s also Italian broccoli, roasted root vegetables, and Moroccan beets with labneh, pine nuts and olives, and each Hanukkah menu serves eight people—or a single, solo serving for each night—at $48 per person. Looking to compile your own feast? There’s also an à la carte menu, which can be found here. Order for pickup at either the Burton Way or Tavern locations. Bring the feast to you with a massive meal that includes not only brisket, but latkes with crème fraîche and apple sauce; roasted market squash with honey and pepitas; matzo ball soup; and a farmers’ market salad topped with everything-bagel crumb and a champagne vinaigrette. Finish with a whole loaf of chocolate babka—and you know no one at the table can turn down chocolate babka. Not classy enough? Upgrade with caviar options that run from simple garnish ($25) to a whopping 100 grams of Oscetra ($284). Feed a fam of 10 to 12 for $420 or a fam of 5 to 6 for $225 by emailing catering@wexlersdeli.com or calling (424) 744-8671. Meals are available via delivery or pickup from the Santa Monica location. One of the city's premier doughnut shops is sugar-coating the holiday with traditional full-size ($4) and mini sufganiyots stuffed with house-made strawberry jam. To get the minis you'll have to order the Hanukkah-themed "mini dozens" variety pack ($22), which also includes miniature cookie-flavored doughnuts featuring a shortbread crumble and vanilla icing, and the mini crème brûlée doughnuts, which are individually torched and filled with pastry cream. Find them in-store or order ahead online.